NZD/USD is holding marginal gains on the day on broad-based U.S. dollar weakness. The pair is trading in an 'Symmetric Triangle' pattern and bias is slightly bullish. Price action is extending bounce off 200-DMA and has edged above daily cloud. Falling U.S. Treasury yields and decline in U.S. stock market weigh on the dollar. Focus today on U.S. Chicago national activity index and Dallas Fed manufacturing business index. New Zealand imports, trade balance, exports (Tuesday) and RBNZ interest rate decision (Wed) will also be watched for further direction. 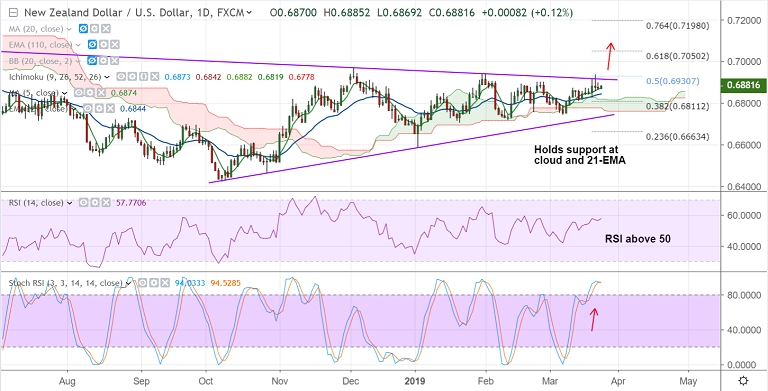 Strong resistance is seen at 0.6915 (trendline). Break above will see gains till 200W SMA at 0.6931. Further upside only on decisive break above. 21-EMA is strong support at 0.6844, break below daily cloud will see near-term weakness.